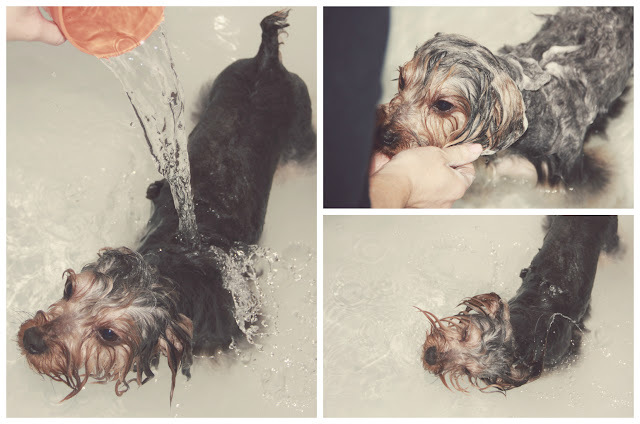 Love is Everywhere: Peanut's Splash Time with Yorkie Splash! Charlie months back did some searching for the perfect shampoo & conditioner for Peanut. We've used so many but were never happy with the final results because his fur wasn't shiny or else it just didn't seem as soft as it probably should be. And then one day Charlie found this website called Yorkie Splash and Shine! 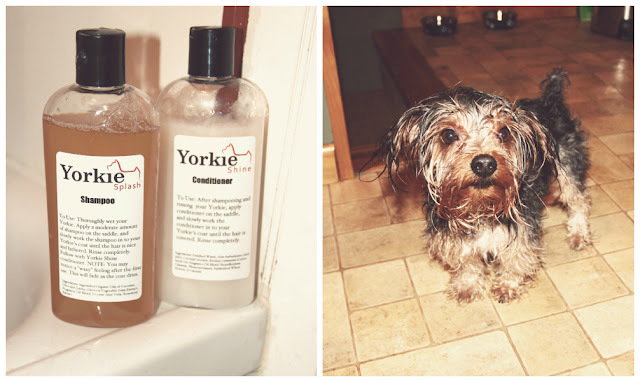 Why we never tried to search for this Yorkie Splash Shampoo & Yorkie Shine Conditioner meant specifically for his breed, I have no idea. Let me tell you that if you smell this set you'll want to wash your hair with this shampoo and conditioner! No lie. Peanut smells so good, and he's so soft for weeks to follow after giving him his bath. There was also a Yorkie Sheen Detangling Spray which we sprayed on him after his bath and periodically throughout the weeks to keep him smelling nice and to prevent knots. With all of the other shampoos we've tried his fur has never been this amazing. The best part of this product is that it's all natural. We don't like to put chemicals on Peanut that can hurt him and this is so wonderful on his skin and not irritating at all to him! He's a Yorkie which are known to have sensitive skin.. not anymore! That's always been important and number one to us when it comes to anything with his hygiene and health. We love this and Peanut really approves! I just had to make a post to share this as Peanut is a big part of Love is Everywhere!